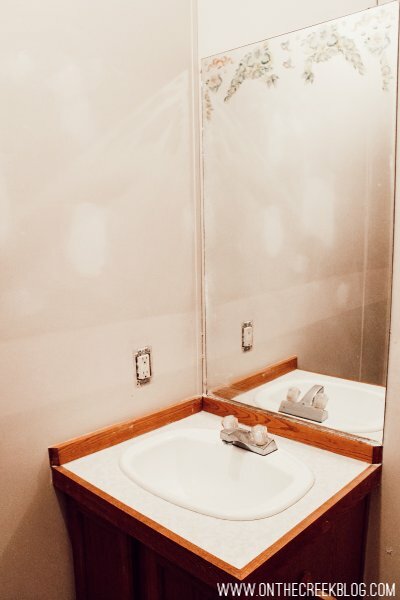 Check out the ‘before’ pics of one of the bathrooms in the Kay House Reno! 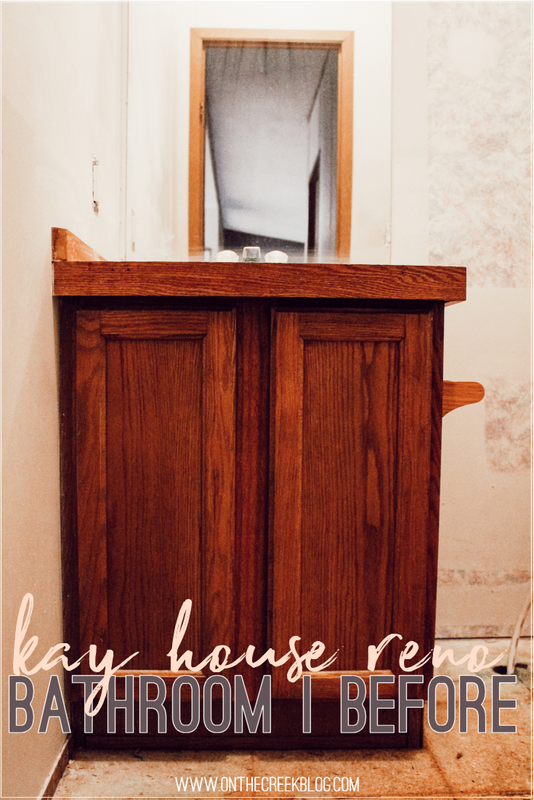 Welcome to the first official post for the Kay House Reno! We’re starting with one of the bathrooms! You guys, this bathroom in TINY! The only thing it has going for it is that the house has super high ceilings, so it doesn’t feel as tiny as it really is! I didn’t take any pics of the bathtub, but we’re leaving that as is anyway. 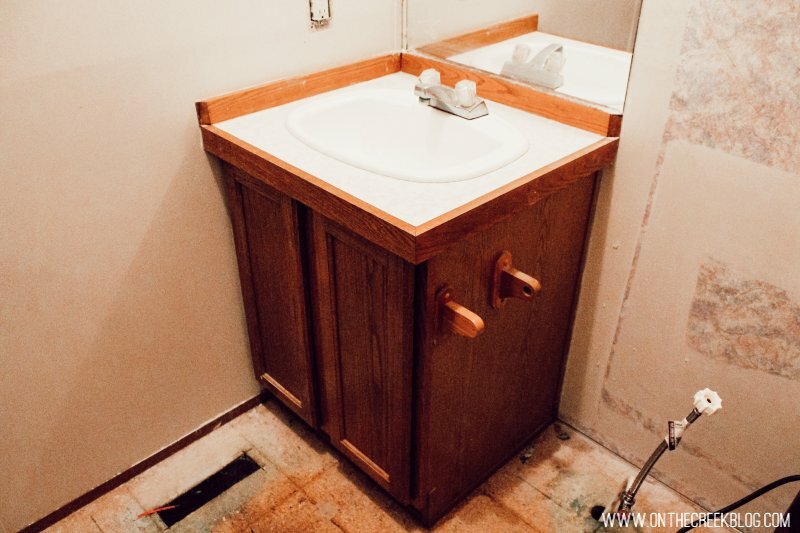 The tub/shower combo is directly past the toilet to the right of the vanity. 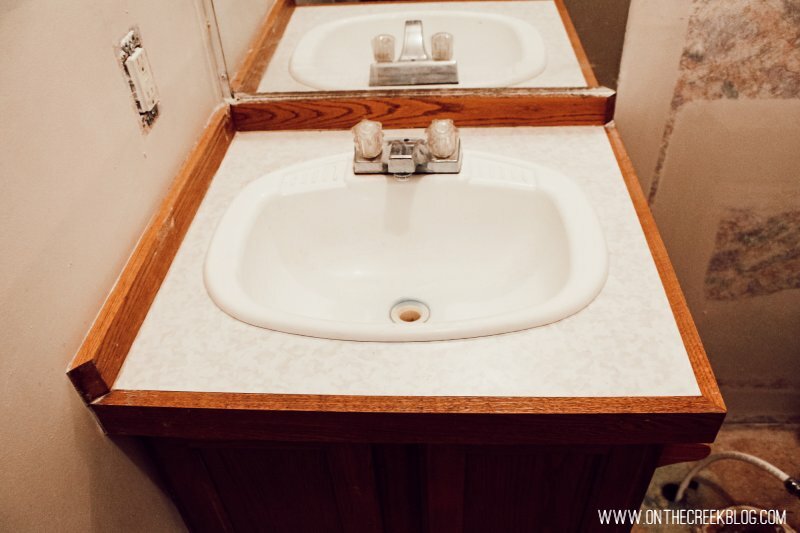 I mainly took pics of the vanity because it’s in for some major changes! 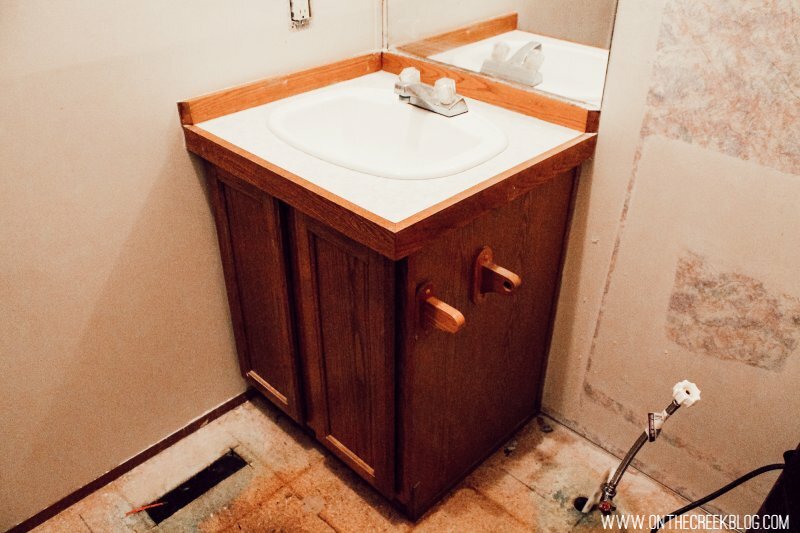 The pipes sticking up beside the vanity are for the toilet. Lucky (?) for us, the toilet was already gone when we acquired the house, so we didn’t have to remove it! It was most likely cracked anyway, so that’s why it was probably gone. 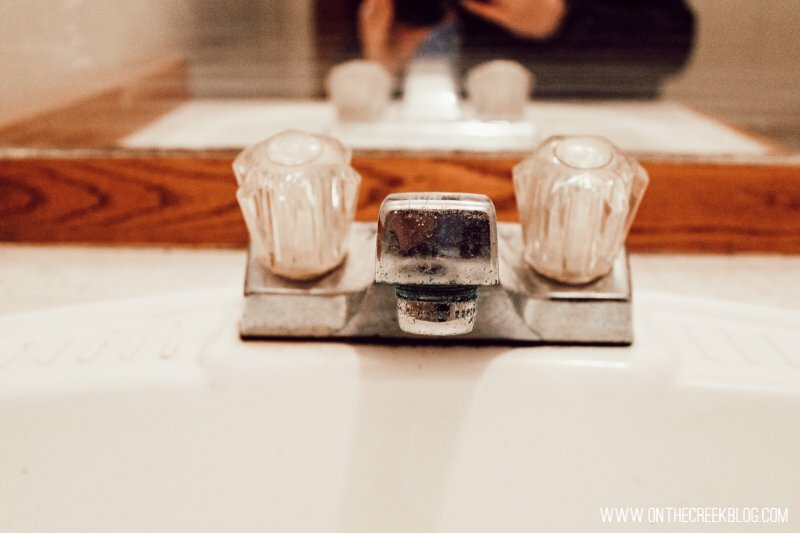 - New faucets: The showerhead was completely gone when we got the house, so it needs replaced. 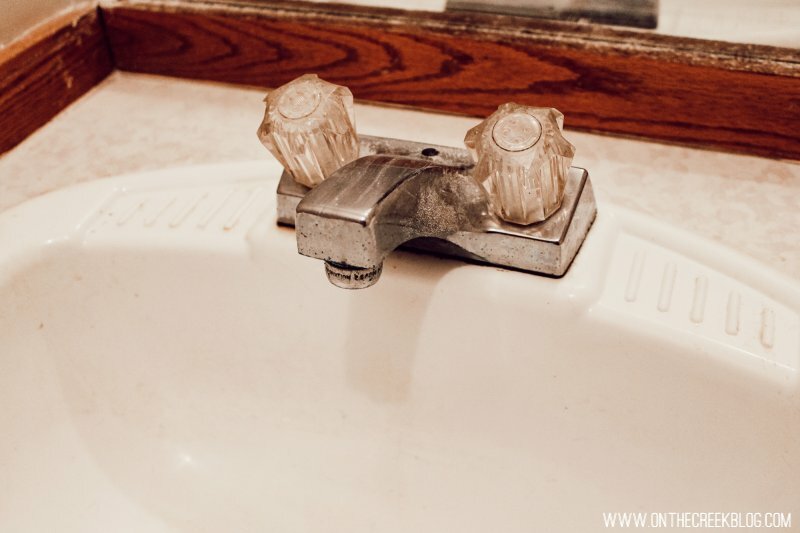 We’re also replacing the vanity faucet & drain. - Fresh Paint: From the ceiling to the walls, the entire room will get a fresh coat of paint! - Paint the bathroom vanity: Alright, so this wasn’t on the official list, but it’s happening. While the vanity looks fine the way it is, painted cabinets are all the rage right now & I wanted to follow suit. I think painting it will give it a fresh new look! 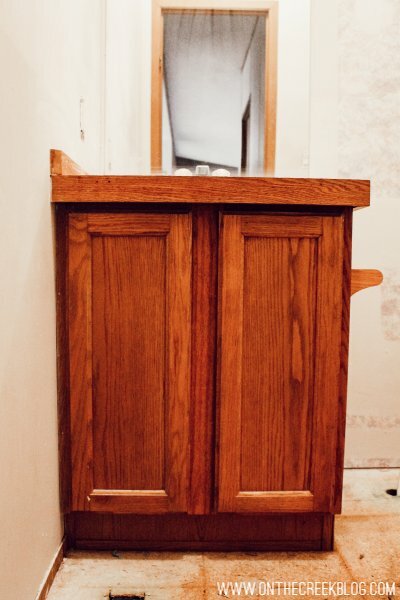 We didn’t want to replace the vanity because it would have been a plumbing nightmare, so I’m improvising! 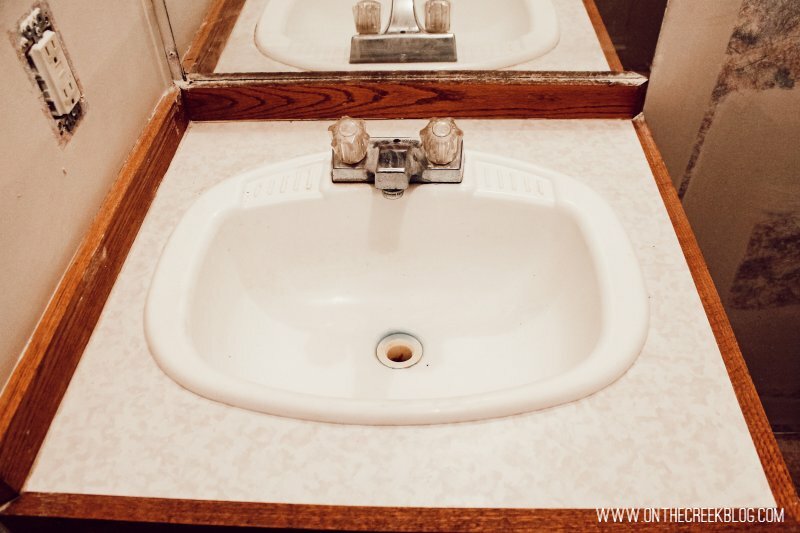 - Bathroom vanity countertop: I hate old school laminate countertops & wanted to change it. Since the vanity is pretty much one piece, changing the actual top part is impossible, so I’m improvising with a tutorial I found on Pinterest. Details coming soon on that! 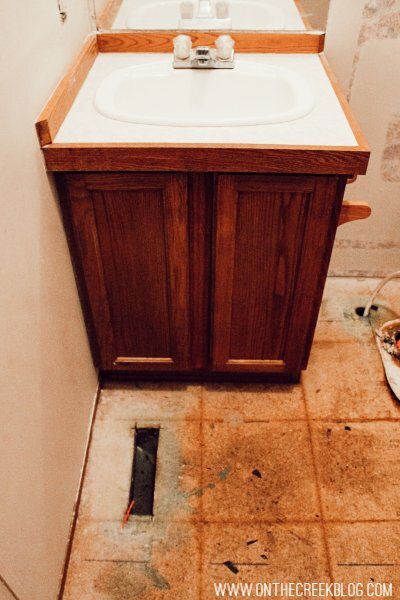 - New bathroom sink: The old sink is a super cheap plastic one, so a new ceramic sink will be put in! 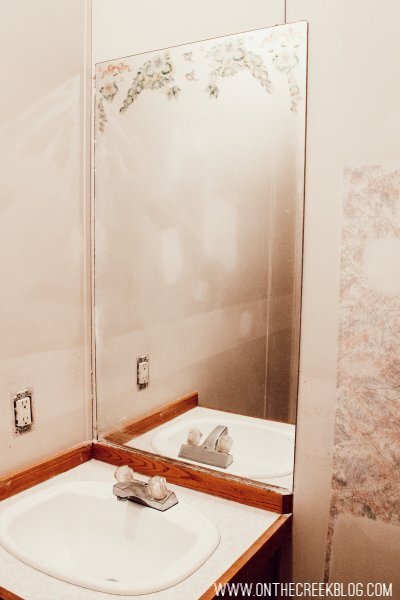 - New mirror: I couldn’t have cared less about the old mirror…except it had that weird design on it! It kept throwing me off, so it had to go! It will probably be replaced with an identical mirror that doesn’t have a design on the top! - New Flooring: Even though I didn’t get any ‘before’ pics, I ripped up the old bathroom flooring. It was peel & stick flooring tiles & I just didn’t like it. The main problem with peel & stick flooring is that is usually ends up peeling back up eventually! I will say that whoever did the flooring in there must have added some extra glue or something because it didn’t just peel right up like I expected! But, it’s gone & new flooring will be going in! - New Hardware: None of the cabinetry in the house has knobs or pulls & it drives me crazy! The vanity will be getting new knobs! Alright, I think that’s everything we’ve got going on in the bathroom! I can’t wait to get this little room completed!